I've never liked brussel sprouts. I can recall once that I've eaten more than two in one sitting. It was at a local restaurant and the roasted brussel sprouts were covered in marinara sauce and mozzarella cheese and came as an accidental side to the dish I'd ordered. Then one day Miss A's best friend's mom introduced me to these magical, delectable, drool-worthy brussel sprouts. I've eaten them four times in the last two weeks. The leftovers are even good microwaved the next day! 1/4 cup chicken stock can also use vegetable stock or white wine. You might need more than a quarter cup. Preheat the oven to 425. Cook the bacon until crisp in an oven proof pan. 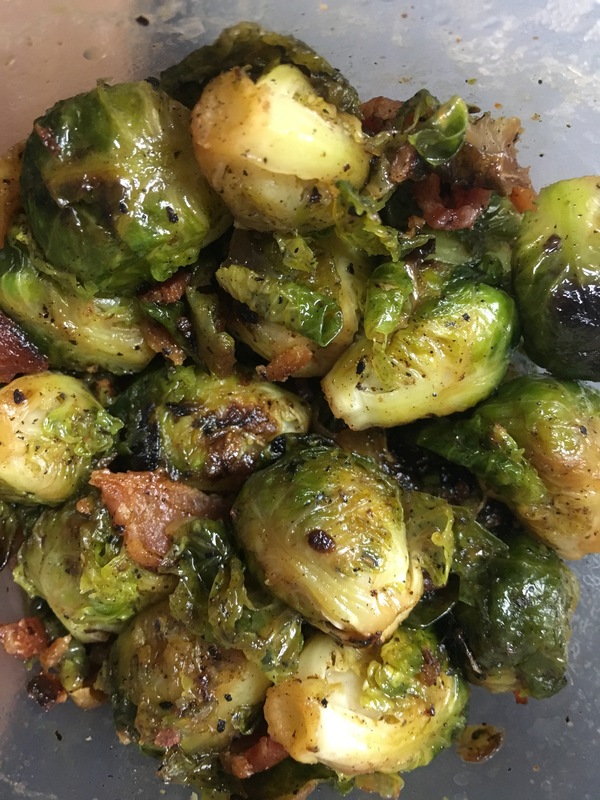 While the bacon is cooking, rinse the brussel sprouts under cool water. Chop off the ends and peel off the outer leaves. (I have no idea why you do this, you just do.) when the bacon is cooked, remove it from the pan leaving the drippings. Then crumble the bacon. If you don't think you have enough drippings *add a bit of the olive oil. Over medium to medium-high heat, sautee the brussel sprouts until they start to caramelize, stirring occasionally. Use white wine or chicken stock to deglaze the pan. Add the brussle sprouts to the oven. Cook for about 15-20 minutes stirring occasionally. If you think the brussel sprouts are getting too done, add some more of the white wine or stock. Remove the brussel sprouts and while the pan is still hot drizzle maple syrup over the cooked brussel sprouts. Stir again. Salt and pepper the brussel sprouts. Stir. Add the crumbled bacon. Stir. Serve warm. I really, really, really like this dish. It's very hard not to eat the whole pan in one sitting.